Delaware 896 represents one of the main routes in Newark as it both joins the city with Chester County, Pennsylvania, and the University of Delaware with Interstate 95 and suburban areas south toward Glasgow. The state route is generally known by its local names through the city, taking New London Road north from West Main Street and Downtown to the northeastern tip of Maryland and Strickersville, Pennsylvania. South College Avenue carries the state route south from Delaware 4 (Christina Parkway) through a commercial strip to I-95. South of I-95 by Iron Hill, Delaware 896 expands into a controlled access arterial to a bypass of Glasgow. The route was expanded from a rural two lane roadway between 1992-97, to both serve increasing commuter traffic south to the U.S. 40 corridor, and truck traffic south to the Summit Bridge across the Chesapeake and Delaware Canal. Continued suburban growth both north and south of the canal justified expansion of the state route to Mount Pleasant. Delaware 896 turns east along Boyds Corner Road between U.S. 301 & Delaware 71 (Summit Bridge Road) at Mount Pleasant and its terminus at U.S. 13 (Dupont Parkway) and Boyds Corner. The formerly rural east-west segment bisects the Bayberry Village community and other newer developments. Delaware 896 was initially designated as Delaware 796, reflecting the previous number of Pennsylvania 896 north to New London and U.S. 1 in Chester County. Delaware 896 appeared first on the 1938 Official Delaware Highway Map, coinciding with its Pennsylvania counterpart. The state route ran south through Newark along New London Road and College Avenue, briefly overlapping with Delaware 273 at the west end of Downtown. South from Newark, Delaware 896 extended to Glasgow and Delaware 71 just north of the 1920s-built Summit Bridge. Delaware 896 travels a convoluted path through the city of Newark, sharing overlaps with Delaware 4 (Christina Parkway) and 273 (West Main Street / Delaware Avenue). 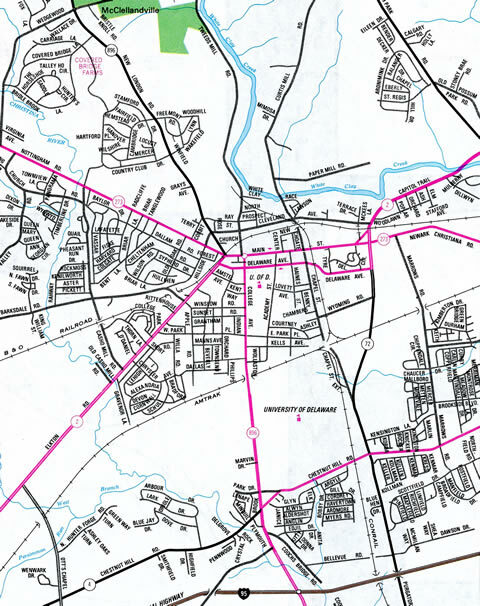 The 1957-58 Official Delaware Highway Map shows Delaware 896 lengthened south along side Delaware 71 from the Summit Bridge to Middletown. The state route traveled through Downtown along Broad Street to Summit Bridge Road south to end at U.S. 13 (Dupont Parkway) near Blackbird. Beyond a shift westward onto the new Summit Bridge in 1960, Delaware 896 remained unchanged until 1983. Delaware 896 following a more linear route through Newark along College Avenue and New London Road in 1981. The southern leg of Delaware 896 was realigned to head east from Mount Pleasant to U.S. 13 at Boyds Corner by 1983. This left the former route south of Middletown as an unnumbered road until 1990, when Delaware 71 took it over. 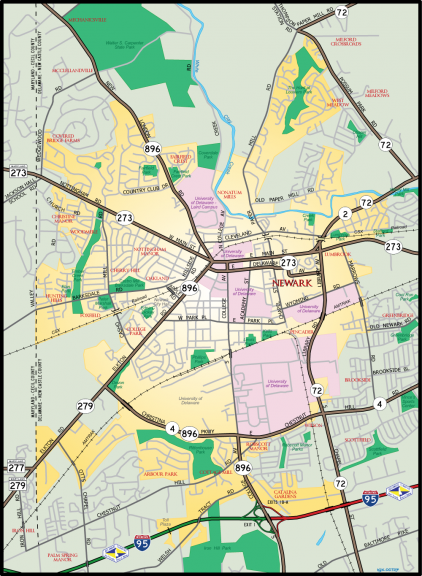 Within the city of Newark, Delaware 896 was relocated from South College Avenue between Delaware 4 (Christina Parkway) and Delaware 2 & 273 (Delaware Avenue) east. The change was made by 1988, coinciding with the realignment of Delaware 2 away from Downtown. SR 2 and 896 formed a bypass along side SR 4 west to Elkton Road, where SR 896 turned northeast along side SR 2 Business to its split alignment along side SR 273 (Delaware Avenue / West Main Street). The Glasgow bypass opened to traffic in 1993 as the new alignment of both SR 896 and U.S. 301 south from U.S. 40 (Pulaski Highway). The expressway, and the associated expansion of SR 896 north and south, were constructed in place of a long planned freeway for U.S. 301 between Middletown and Interstate 95. Interchanges were planned along the SR 896 corridor at U.S. 40, Old Baltimore Pike, and Porter Road, but dropped due to community opposition. However, an interchange will be built at SR 896 and U.S. 40 after all due to substantial traffic congestion and safety needs. A number of changes were approved for the city of Newark in Fall of 2013. Of those, the overlaps of SR 2 with SR 4 and 896 along Christina Parkway and SR 2 Business along side SR 896 on Elkton Road were eliminated. SR 896 now travels Elkton Road, and the portion renamed to South Main Street, solo from SR 4 to the north/south separation with SR 273. Country Club Drive east at SR 896 (New London Road) at Fairfield in north Newark. Photo taken 05/15/05.